To promote a cleaner community, educate their peers about the environment, and combat the problem of flash-flooding in their region, two alumni organized a group of volunteers to install biopori holes at eight schools in their community. Biopori holes are narrow holes dug about a meter deep. A six inch pipe is cemented in place at the top of the hole to prevent collapse. Natural composting materials–like leave– are thrown into the hole to decompose. 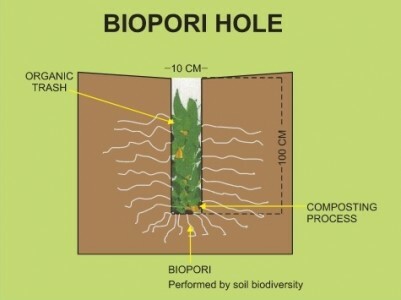 The decomposition of the natural compost draws worms and other bugs to the hole, creating a tributary of tunnels around the biopori hole. In a flash flood situation, water quickly drains into the biopori hole where it is absorbed at an extremely fast rate. Activities: Sasky and Reza, from Cilegon, Indonesia, were two of twenty youth leaders selected to participate in Legacy’s Indonesian Youth Leadership Program in 2010. Each youth returned home with follow-on project plans to improve their community. Sasky and Reza worked together to combat flash flooding in their community and to get students excited about the environment. Student conclusions: The ten core volunteers recruited by Sasky and Reza were enthusiastic about continuing the program, particularly about being able to meet with and help students at other schools. Sasky and Reza supported their volunteer team and they are making signed certificates of appreciation for members of their team. Institutional changes: This project connected high school students with younger students (middle school and elementary) and older students (the university donated them biopori tools). They had an incredible amount of administrative support – student groups were let out of class so they could go do seminars and dig biopori holes at the different schools. holes– and plan on encouraging other schools to create environmental extracurricular activities for students and to focus on environmental issues more in class. The I-US-YLP initiative is sponsored by the U.S. Department of State’s Bureau of Educational & Cultural Affairs and implemented in partnership with the Center for Civic Education Indonesia (CCEI).